Everywhere you go, chances are you will see magazines on sale, or at least someone reading one. 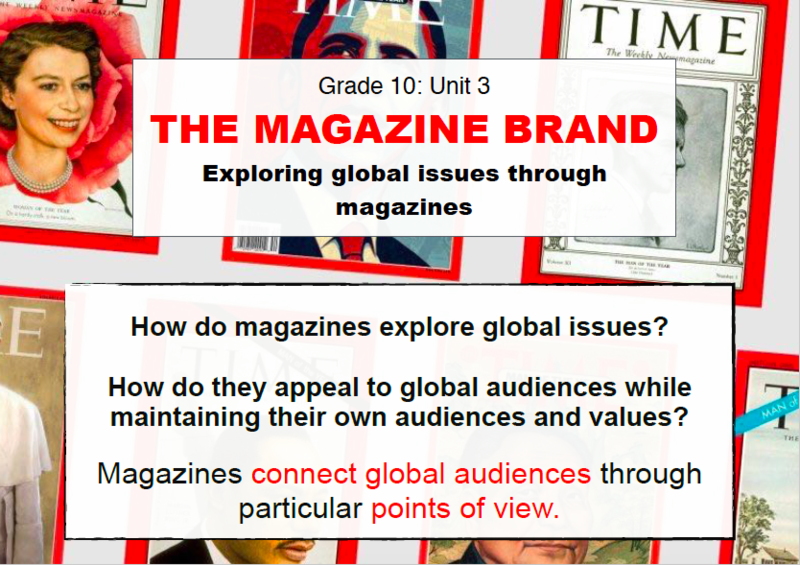 In this unit, we will explore the magazine as a whole and many of the text types contained within (such as the editorial, feature article, advertising). We will see how magazines such as Time, The New Yorker, The Economist and others engage particular audiences about global issues but do so in a way that preserves a particular point of view or ‘brand’. We will critically read Time together as a class before breaking up into smaller groups to investigate different magazines. We will practise skills of close analysis, essay writing, oral presentation and creative writing. What better place to begin a unit on magazines that with cover pages? We will begin by reading the cover of Time magazine and producing cover pages of our own! We will explore the first few pages of Time magazine to uncover what its ‘brand’ is all about. We will revise and deepen our knowledge of advertising elements at the same time. Magazines contain a variety of text types that contain peoples’ opinions and arguments. In this lesson, we will examine a variety of these, including the letter to the editor, the editorial, op-ed, opinion column. Contained within any magazine will be longer-form stories that analyse and explore different topics. These texts go beyond the mere factual recounts of ordinary news reporting and present unique perspectives and emotive accounts on topics of great human interest. Today, we will learn about the content, structure and style of the feature article. In these lessons, we will discuss the value and learn the process of close reading. We will also examine so IBDP SL language and literature unseen-commentary papers and practice for our upcoming exam. In these lessons, we will explore our assigned/chosen magazine to get a better sense of its ‘brand’. We will also analyse texts contained within and prepare oral presentations to communicate our findings to the class.